I had high hopes for this book. A nonfiction account of one of history’s most intriguing characters written by one of the most popular authors of crime and suspense fiction…it seemed like a sure thing. Unfortunately, I’ve rarely been so disappointed in a book. 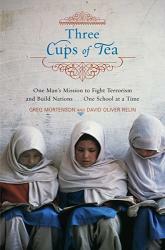 There are three nonfiction stories being told simultaneously in the book. 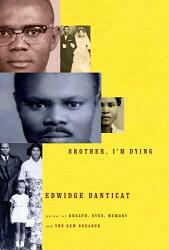 First, Patterson writes about his excitement while planning and researching the subject with co-author Martin Dugard. Second is the story of Howard Carter, the British Egyptologist who discovered the 3,000 year-old, long-lost tomb of King Tutankhamen in 1922 after years of searching. 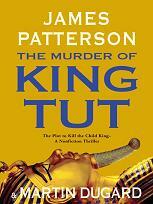 Third is the story of King Tut himself and the events leading up to his supposed murder when he was only 19 years old. All three storylines are interesting and woven together well. But the problem I had with the book is one that often comes up for me when reading books by authors like Patterson or Baldacci, whose prolificacy sometimes seems to come at the expense of quality writing. In other words, I really feel like he phoned this one in. The language was simple, the text was printed in large font and most chapters were about a page and a half long occasionally even breaking up conversations, which was very disruptive. It felt a little like reading a report written by a middle schooler who was trying to use fluff-up tricks to make the report long enough. And unfortunately, I can’t even recommend it for young readers, because while the reading level is certainly juvenile enough, the book contains one episode of violent sexuality that keeps it firmly on the adult shelf. Also, I’m not sure exactly why this book is considered nonfiction rather than historic fiction. Patterson makes sure to explain that he is meticulous about his research and includes known facts and generally accepted suppositions whenever possible, but the Tut portion of the story reads so much like fiction, including events and conversations that are impossible to know for certain that I think it should be considered fiction. If you want a quick lesson on King Tut or Howard Carter I’d suggest skipping this book and just hitting wikipedia for the same facts and a lot less fluff. Remarkable Creatures is a collection of “epic adventures in the search for the origins of species.” The book is made up of short non-fiction accounts of some of the most influential scientists and researchers from the early 1800s through present day who studied the history of the earth and those creatures that have lived upon it. 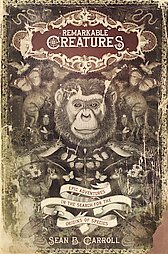 The title of the book seems not only to refer to the menagerie of species, both living and extinct, that were the focus of study, but also the singular men and women who studied them. From the naturalist Humboldt who explored the wilderness of South America and Mexico for many years in the early 1800s collecting specimens and cataloging previously unknown plant and animal species, to Darwin whose own exploratory findings lead him to put forth his controversial hypotheses on the origin of species, Remarkable Creatures presents historic facts and theories while also creating an interesting narrative of the main characters and their adventures. From Humboldt and Darwin, continuing chronologically, the book then moves into the era of paleontology. With several new theories put forth in the mid and late 1800s, there were many scientists anxious to prove, disprove or offer their own hypotheses. Each character is presented as the star of their own story, often starting from childhood. My favorite of these adventurers was Roy Chapman Andrews, a fellow from Wisconsin who loved spending time outdoors as a child while growing up in the late 1800s and who desperately wanted to pursue a profession in natural history. Even though he had never traveled farther than 90 miles from his home, on the day of his graduation from a nearby college he declared that he was going to New York to try to get a job at the natural history museum. Though he was told there were no positions available, Roy said that he would be happy to clean floors just so that he could be at the museum. Slowly, he worked his way up, impressing the museum director and his co-workers, eventually leading to a number of field expeditions. During World War I Roy secured an assignment as a spy, working under the cover of collecting zoological specimens in Asia. After the war ended, Roy proposed a grand Mongolian expedition to the museum president, outlining all necessities and addressing the many logistical challenges. The president was immediately captivated and Roy then went to visit a number of Wall Street tycoons for financing. The expeditions that followed were tremendous successes, unearthing thousands of fossils and the first dinosaur eggs ever seen. Roy was the image of a new breed of explorer-scientist, and with his ever-present hat and rifle, and infamous fear of snakes, it is no wonder that many assume he was the original influence in the creation of the character Indiana Jones. The book tells the stories of many such interesting characters, including Luis and Walter Alvarez, a father and son team who determined that a meteor struck the earth roughly 65 million years ago causing widespread devastation, and the husband-wife team Louis and Mary Leakey who, in an attempt to find a humanoid “missing link” in Africa, uncovered fossils never before seen. There are stories of the search and discovery of fossils linking dinosaurs and birds as well as the missing “fishapod” which served to form more links in the evolutionary chain. The final chapters in the book focus on recent advancements in genetic aging techniques and where the field might go from this point. The book is well composed; a lot of information presented concisely and without too much of a heavy scientific hand. Written by a professor and scientist in the field of molecular biology and genetics, it is apparent that Carroll loves the subject matter. If I have any criticism of the book it would be that on occasion he seemed to get overexcited about what he was writing and would throw in a bad pun or two and interrupt the flow, but overall a very interesting and informative history that can be enjoyed even by those of us without exceptionally scientific minds. The Great Influenza is “The Epic Story of the Deadliest Plague in History,” i.e. the Spanish Influenza, which killed as many as 100 million people worldwide over a period of 24 weeks in 1918 and 1919 during the height of World War I. This book is indeed epic in scope and it took me quite a while to get through it. That wasn’t because it was tedious or boring, but only because of the massive amount of information it contains. It’s not a book to be consumed quickly, but must be digested in small amounts, bit by bit. Always fascinating and immensely educational, The Great Influenza is two parts history lesson and one part crash-course in bacteriology. Sandwiched between biographies of some of the most influential scientific researchers during an exciting period of world-wide medical enlightenment is a detailed account of the epidemic’s destructive, murderous path from its probable origin point in rural Kansas to army cantonments throughout the country and then with American soldiers to France, England and on to the rest of the world. With the current swine flu outbreak it was particularly interesting to learn about the nature of viruses and the influenza virus in particular. The book offers a detailed layperson understanding of how influenza can be transferred from animals to humans and also how and why some strains are so mild and others so deadly. It also explains why researchers who were so frantically looking for ways to control the disease in 1918 were having trouble. They were unable at that time to even identify the pathogen and cutting corners while performing research experiments in an effort to develop an anti-serum more quickly did not help. **Politics played far too great a role in the number of fatalities. Because of the war, politicians were reluctant to even admit the existence of the epidemic for fear that it would lower morale. Although local governments in large cities were advised to enforce laws against public meetings, most refused to comply and newspapers did not run warnings or advice until late in the epidemic. **The misnomer “Spanish Flu” was given to the disease because Spain was the first country to have newspapers running headlines announcing the epidemic. They were not yet involved in the war and therefore were not censoring their media. **The 1918 influenza epidemic killed an unusually high percentage of healthy, young people between the ages of 21 and 40, which is typically the age group with the greatest survival rate. The reason is that this particular strain of influenza was so virulent that the healthiest immune systems would often launch such aggressive attacks that they would essentially destroy the victim’s lungs and/or heart. **The influenza may have indirectly been responsible for events leading up to the start of World War II. While in France negotiating peace terms with representatives from Britain, France and Italy, Woodrow Wilson became ill with influenza. He was bedridden for days, and though he recovered, the illness appeared to have altered his mental capabilities (minor brain damage was later proven to be a common side effect of severe influenza). He suddenly and inexplicably gave in to all of France’s demands which included many harsh penalties against Germany and set the stage for things to come. Wilson never fully recovered and for the rest of his term, many presidential decisions were made by his wife and personal physician. I only wish this book could have contained an afterword addressing the recent H1N1 influenza strain. It’s possible that information may be added at a later time since I think there was an afterword added regarding the avian flu in an edition published after the version I read. It would be interesting to know the specifics of the swine flu’s makeup and how it compares to the other epidemics since 1918. If the 1918 flu is any indication of how things could play out, the mild outbreak that we saw this spring could be followed by a much more severe outbreak this fall. I highly recommend this book with the warning that it may take a while to get through. If you’re like me, you may want some nice, easy fiction to read at the same time. And as a coincidental anecdote, an older gentleman stopped in the store a week ago. He was from Michigan and was visiting his mother here in Floyd. Without mentioning that I was reading this book he told me that his mother, who is now in her late 90s, took him to a family graveyard and showed him the row of tombstones which were all marked with dates within the same couple of weeks in 1918 — all victims of the influenza. The Great Influenza is available at noteBooks in trade papaerback for $16.00. A Long Way Gone is Ishmael Beah’s autobiographical retelling of his experiences as a child soldier in war-torn Sierra Leone in the mid-1990s. As a child Ishmael lived a relatively happy and normal life with his family in Mogbwemo, a small west African village. He attended school and was an excellent student. He enjoyed American rap music and would choreograph dances and performances to the music of his favorite artists with his older brother and friends. They played sports, hunted birds with slingshots, went to the movies in nearby Mattru Jong and watched curiously as refugees passed through with tales of war that seemed exaggerated at the time. When Ishmael was twelve the rebel army (RUF) attacked Mattru Jong and surrounding villages. Ishmael, his brother and their small group of friends escaped capture and traveled on foot looking for food and survivors. Eventually, after spending a year on the run in the wilderness and without finding his family, Ishmael was picked up by the government army, given a gun and trained as a soldier. After two years of fighting, at the age of fifteen, he was removed by UNICEF and taken to a rehabilitation center to begin the process of healing, detoxification and self-forgiveness. The way the book is written is interesting: Ishmael writes in first person while describing the time period that he was a refugee, and also the time in the rehabilitation center. However, while writing about the two-year period that he was a soldier, he writes in a series of flashbacks and memories. I wonder if he chose to write this way because he prefers to keep that time more distant from himself or because it really is harder for him to remember (the army kept their soldiers high on amphetamines and brown-brown, a mix of cocaine and gunpowder). Whatever the reason, I appreciated it because some of his acts were so atrocious that the distance is necessary to see this person as someone who has been rehabilitated. The reader is still made completely aware of the depth of horror, without it becoming gratuitously violent. I’m really amazed that someone could go through what he did and then re-learn how to have a reverence for human life again…is that a trait of humanity in general, of the culture, of youth or of the individual? Ishmael never found any surviving members of his immediate family. In 1998 he escaped Sierra Leone and moved to the United States to live with a foster family. He graduated from Oberlin College in 2004 and is a speaker and activist dedicated to helping former child soldiers reintegrate into society and improve their lives. A Long Way Gone is one of those books that everyone should read. It should be added to high school and college history classes that cover recent events (I’m sure some teachers and professors already require it) and it may even be a useful resource for psychology courses covering child psychology. I highly recommend this book for all adults and teenagers. The descriptions, details and metaphors are unique and emotionally stimulating. This is an important story told by an honest and gifted narrator who has roots in a culture of storytellers. On September 18, 2007 Randy Pausch delivered a lecture at Carnegie Mellon University entitled “Really Achieving Your Childhood Dreams” as part of an ongoing “Journeys” series which asked professors to create a lecture as if it was their last — thinking hard about what really mattered to them. Unfortunately, this really was to be Pausch’s last lecture since he had been given a terminal diagnosis of pancreatic cancer the month before. Pausch was told that he had 3-6 months to live and as a result, his last lecture was really something special. Pausch only had an hour for his lecture so in the book The Last Lecture he expanded on his points, describing in detail how, through hard work, resourcefulness and a bit of luck, he achieved nearly all of his childhood dreams. Pausch was a professor at Carnegie Mellon University, had also taught at the University of Virginia and was a significant contributor to the field of Computer Science. He gives professional and personal advice on dealing with difficult people and what to do when you realize you’re the difficult one. He shares stories of speedbumps he experienced and how he overcame them. He also shares his thoughts about dealing with a terminal illness, knowing that your days are numbered and how to best use the time you have to tie things up and leave a legacy for your family. Pausch rationalized spending a portion of his precious, limited time on writing his last lecture and this book stating two important goals: He did it for himself, to prove that he could accomplish this final, difficult task despite the foreboding knowledge of his imminent death, and he did it for his three young children, to whom he wanted to give something of himself that would be available for them when they got older and wondered what kind of person their father was. There is even a chapter near the end of the book where Pausch speaks directly to each of them. The reader may feel as if they are intruding on something very personal, but it’s this sharing that allows us to feel especially moved by his emotion and character, and in that way his message to them is a gift to anyone who reads the words.